Cortex Plus Creator Studio Now Live! Recently, Margaret Weis Productions has announced and launched the Cortex Plus Creator Studio (CPCS) program in conjunction with DriveThruRPG.com. This new program allows fans such as yourself to offer supplemental materials, such as setting hacks, using the Cortex Plus system of rules and its variants. To do so, you’ll need a copy of the Cortex Plus Hacker’s Guide, which currently serves as “the” rules for Cortex Plus Action, Cortex Plus Heroic, Cortex Plus Drama, and Cortex Plus Fantasy Heroic variants. Many fans have been excited to see what the rules can do, because Cortex Plus offers a lot of possibilities due to its simplicity and flexibility. Because gameplay is heavily focused on character interactions, the rules facilitate twists and turns in the plot. Each system variant, then, provides a different flavor, or style of play. Signing a work-for-hire contract means that legally we don’t own the work we do, and once we’re paid for that work the companies take our contribution and use that as they see fit. While every license, freelancer, contract, and company is different, writing under these terms typically means we have less flexibility as creators than if we were to do the work ourselves. The CPCS gives both fans and creators more control, because while the agreement does have some limitations, the work you upload is based on your own settings and design ideas with no oversight. The only requirement is that your work is tied to the stellar Cortex Plus Hacker’s Guide. Thus, while your material is supplemental, you decide what you want to do with it. If you’ve got a setting hack or a pile of Distinctions/Talents/Powers, etc. you’ve been sitting on, I encourage you to check out the new program. Just remember: licenses such as Star Wars and Firefly aren’t part of this program. The CPCS is strictly meant to be used for your own worlds, your own stories, and your bursts of creativity and brilliance. I’m looking forward to seeing what comes next for Cortex Plus, and I hope that its future will include you. Recently, I was interviewed for Dragon+ Magazine about Battle for the Undercity, along with Joshua Raynack and industry veteran Jon Leitheusser. Matt Chapman, the editor-in-chief for Dragon+, reached out to me after seeing that my work had been reviewed in a March 2016 Unearthed Arcana article by Mike Mearls and Chris Lindsay. This entire experience has not only been positive, it’s taken me completely by surprise, and I’m happy that folks are enjoying my work. I’ve received a lot of support and cheers for my efforts, and a lot of complements on my Battle for the Undercity 5e design post as well. This entire experience has been stellar, and it’s definitely encouraged me to do more work on D&D 5E as time allows. Thanks to Mike, Chris, and Matt! I hope you’ll check out this month’s issue of Dragon+ Magazine, and it inspires you to grab your dice. After all, the entire point of being in the gaming industry is to create memorable (and fun) experiences for you. Roll thee well! Come Steampunk With Me. SteamCraft RPG Now on Kickstarter! 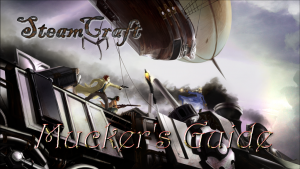 In the spirit of Gibson and Sterling’s The Difference Engine, SteamCraft takes you to an alternate, dystopian world where gears, goggles, and airships dominate life. The Industrial Age is joined by an early Information Age, combining into a gritty world where corporations use technological advances to amass hordes of wealth and power at the expense of the working class. Meanwhile, technomages’ ability to create by mixing magic with machine lurches ahead of their wisdom to control their creations and where scientific exploration is best done in coal powered airships venturing beyond the charted world maps. Just as Shadowrun mixes cyberpunk and fantasy, SteamCraft mixes steampunk and fantasy. The scientific wonders of Jules Verne and H.G. Wells mix with fantasy elements like dwarves and elves. The result is a world filled with ancient horrors as well as man-made beasts. Now, you can back the SteamCraft RPG Player’s Guide on Kickstarter and ensure that my worldbuilding skills are put to good use! That can’t happen, however, unless we fund… So what are you waiting for? On David McDonald‘s blog, I wrote a post about the debts I’ve paid to become a writer. I hope that by sharing my story, it will help other writers who have experienced something similar, understand and take comfort in the fact that you are not alone. Paying for My Passion (Valentinelli) is the kind of post that’s both personal and cathartic to write, but I feel that it was an important exercise for both me and you. You see, the one thing I’ve learned throughout all of my experiences, is that there’s a difference between feeling alone and being alone. Abusers in any form, whether they be domestic or not, focus on isolation as a means of control. For writers like myself, who are naturally introverted to varying degrees, this can be disastrous to our psyches. I need to recharge my creative batteries by spending time by myself, but at the same time, it was hugely important for me to understand I wasn’t alone in my experiences. They are two, very different things, and I fear that sometimes the nuances are conflated simply because when you’re an introvert you’re already told spending time by yourself, whether that’s going it alone to a movie or a coffee shop, is “anti-social”. If my post resonates with your experiences on any level, I want you to know that I support you. I do. Being a writer is both a curse and a blessing, especially in this society; the ability to tell stories and use words to relay information is a gift we have, but at the same time? We all need to eat. In My Ears: Soundtrack for Star Wars. No, not THAT Star Wars, the other… Never mind. Book Last Read: Reading like a crazy woman… I should really track these better. Latest Game Release: Codex Infernus: The Savage Guide to Hell. I realize this may come as a shock, but writing is work. Like any other job, writing can be a calling and, in my case, it definitely is. But, how to move forward, how to take on/find more mini-jobs, how to build a career… That is where my head needs to be, and where it’s always been when I’m not suffering from bad stress. I realize this line of thinking, to treat writing like work and an actual job, is unsexy. It’s plain. It’s vanilla. It’s yet another cat picture, and not a good one at that. But, if I don’t take it seriously and treat writing as a job, I don’t write, because then it’s not a priority for me. Then it’s a hobby that I do whenever I feel like it, and that is hugely damaging to my career. Realization time! Every rotten moment I have had as a writer originates from bad stress, and the vast majority of those moments come from what I couldn’t control. Why am I not beating myself up over it? 1) That’s in the past. 2) I can only manage what I can control, but the number one thing I need to do is write. Period. And 3) Encountering bad stressors is normal, because it happens to everybody. What matters, then, is what I do next. How do I use those moments to inspire me to keep at it? To this end, I use the K.I.S.S. system which I am quite fond of. I use K.I.S.S. as a motivational tool, rather than as an excuse to sacrifice quality or take shortcuts, etc. Here’s what I do. Ready? It’s so simple, I probably sound like an idiot who mixed anchovies and oranges and peanut butter together with vinegar. Ew! Anyway, here goes: I come up with slogans to cheer myself on. Can’t get paid unless I hit Send! Want to be a novelist? Finish my novels. Want to be hired for comics/novels/etc.? Finish my comics/novels/etc. on spec. Or, alternatively, I come up with a zillion mini-goals I can sneak in throughout the day that I know I can achieve. This helps reduce bad stress related to feeling like I’m not getting the non-writing bits done, provided my priorities are in place. Notice, none of these goals are meant to take longer than an hour. I am a mini-tasking self-proselytizing evangelist, as breaking up larger goals into smaller chunks really helps me get through the day. Spend 60 minutes on a word sprint! Notice how all of this is to ensure I stay on task and write? A focus on word count and production doesn’t mean I don’t care about building relationships or forming networks, etc. This is all about reducing bad stress by ensuring I don’t get distracted, as words are my stock and trade. ‘Cause when I don’t write? That is the worst possible stress of all. That’s when I don’t have any reason to plan for a career, because I have nothing without dem words. Caffeinated Beverages Consumed: Ummmm… More than I should, but not enough to float.